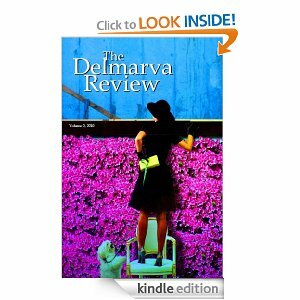 You can now download Volume 3 of The Delmarva Review! Although it publishes its share of regional writers, this lively, well-designed literary journal reaches beyond the Delmarva Peninsula for its poetry and prose. It’s a wise approach that broadens its pool of talent and the scope of its content. This issue features contributors from Montana, Tennessee, Colorado, Wyoming, the Philippines, and Quebec, alongside local standouts such as Pulitzer Prize nominee Sue Ellen Thompson and University of Maryland Professor Emeritus Rod Jellema. Not surprisingly, the writing brims with references to ebb tides, loblollies, hunting season, cattails, skipjacks, and various Bay landmarks. Of the poems, Thompson’s “A Burst Pipe in Maryland” is a gem of economy and emotion, as she transforms a plumbing calamity into a multifaceted examination of personal grief—in just two short verses. But my two favorite selections explore subjects that have little or nothing to do with Delmarva. Gwen Florio’s “On Fire” is a peculiar and tender piece about firefighters in the wilds of Montana, and Sunil Freeman’s “My Danny Gatton Story” recounts the writer’s admiration for a beloved and obscure guitarist, who eventually took his own life. Such pleasant surprises make The Delmarva Review a satisfying read. Check out Volume 3 and download it today!